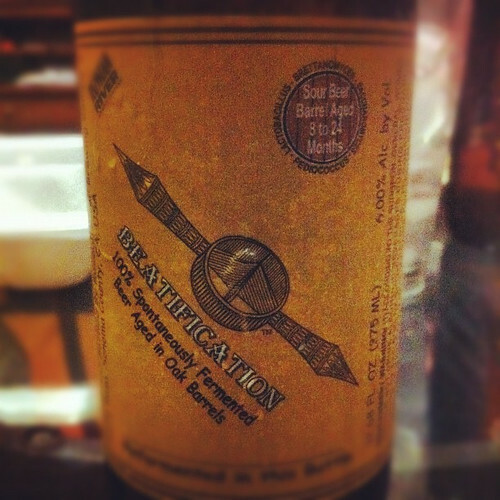 Lightning Review: Russian River Beatification | Drink. Blog. Repeat. Occasionally, my friend Dan is nice enough to invite me and a few other friends over to his house for some pretty amazing tastings. He’s extremely gracious with his offerings, and the tasting he hosted this past weekend was no exception. Sadly, I was too excited – and too far in to the tasting – to bother to take notes, but here’s a lighting review from what I can remember. The pour is a hazy golden orange with a pillowy white head that leaves some nice lacing. The nose is incredible. A massive, gargantuan tartness, funk and oak characteristics. Mountains of pear, green apple and white grapes. Very crisp smelling as well. Absolutely phenomenal taste. It’s got an acidic tartness, a slight oak on the back and a big funky note. The tastes follow the nose: sour apples, pears, grapes, etc. The oak imparts kind of a mustiness that works well to balance the tartness. The finish is very dry and leaves you wanting more. Lightning wrap-up: Dan’s awesome. This beer’s awesome. If you ever have the chance, drink it.